hospital bed. I attended night for you. I guard[ed] my Master’s Head. In dreams I gave you eyes. day. I should have wished your body away—erased the flesh of you, the flaw. Hadara Bar-Nadav’s book of poetry A Glass of Milk to Kiss Goodnight (Margie/Intuit House, 2007) won the Margie Book Prize. 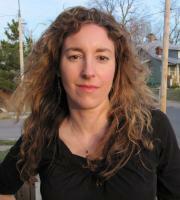 Her chapbook Show Me Yours (Laurel Review/Green Tower Press, 2010) won the Midwest Poets Series Award. Recent publications appear in American Poetry Review, The Iowa Review, The Kenyon Review, Ploughshares, Prairie Schooner, and other journals.